Periwinkle is a garden where young minds blossom to their natural abilities without the stress of forced learning. 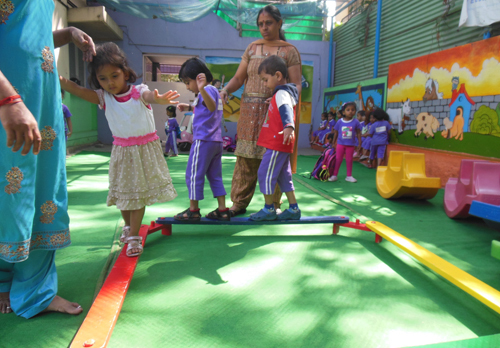 Periwinkle is one of the best play school in Uttarahalli, Bangalore. Periwinkle is a cheerful bright zone with caring teachers, classrooms filled with colorful playthings, and a vast outdoor to jump and play with joy. 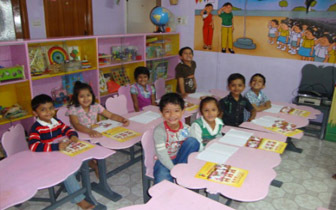 Our children learn in small groups with a maximum of 1:7 ratio and our emphasis is on emotional and social coaching. Our teachers are compassionate and loving. Every staff member provides an inspiring and joyful environment. Periwinkles, as we call our children, are from diverse family backgrounds come with a wealth of interests and abilities. Growing and learning in such a place would help our children get started on their lifelong adventure of learning. At Periwinkle the day begins with a "Smile" and "Good morning!!!" from teachers to all the kids walking inside the gate. Children are brought to good happy mood by letting them for a free play in the outdoors. After a while teachers sing songs to keep the toys away and line up for National anthem and daily prayers. A brief warm up session of simple physical exercise follows after the prayer. Children are segregated according to their age and taken to respective classes. A story is told to introduce the concept to be taught with appropriate props. 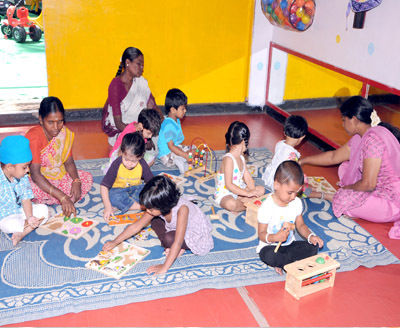 Activity time makes the children more familiar to the concept taught with an orientation to tap on aesthetic talent in a child. Personal hygiene is taught during the time before snack break. Snack time follows after a short thank you prayer under the continuous supervision of teachers and helping staff. It's time for planned outdoor activity, giving a thorough exercise to all the gross-motor muscles. 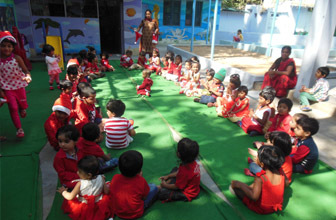 Rhyme time with puppets, music and dance begins ones the children are inside the class again. Different puzzles and indoor toys are given to children to strengthen their fine-motor skills and to tickle their brain cells. Math and Language activities are done according to the class they belong to. Revision time is to recall everything that the children have learnt from the morning. 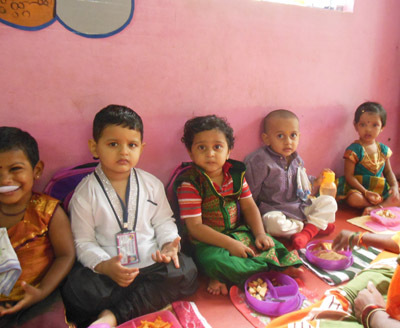 The above process completes a cycle of “3R”s Read, Recite and Recall, and also nurtures their holistic (spiritual, moral, cognizant, physical, social and emotional development) learning on day to day basis. After the school, kids will have some free time to play around and relax. Children wash their hands and legs after the play time. It's Time for lunch with Periwinkle’s yummy and healthy food. A good care is taken on the cleanliness, nutritional value, and taste while cooking. After sumptuous lunch, it is nap time for kids. 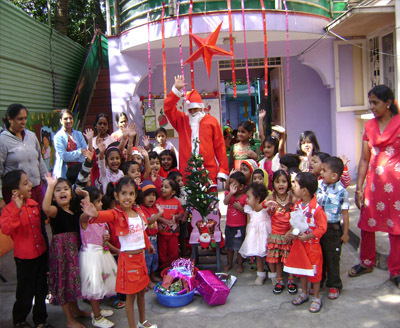 Everyday different group activities are planned to keep them happily engaged till their parents arrive to pick them up. 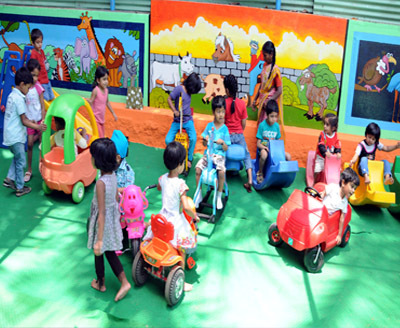 Apart from the everyday routine, there are lots of special activities that are designed to provide the kids with life skills and to make a child's stay at Periwinkle more enjoyable and interesting. Every new concept introduced to a child is made to learn through stories. Stories are the genre, which a child finds amusing. The children are taken to another imaginative world which puts them on the process of questioning and reasoning with a context. 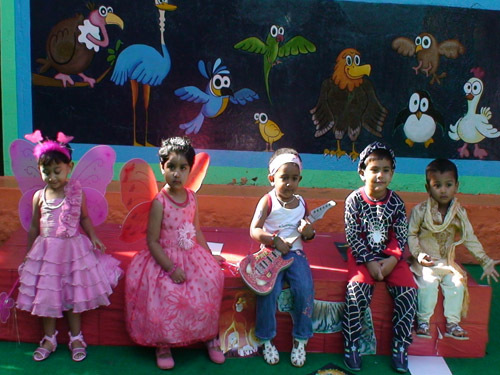 The food for thought is provided to the young minds through Periwinkle's creative curriculum of stories. One of the best ways to enhance reading habit in a child is to make reading material easily available. Giving books that are appropriate and attractive to their age group gets children attracted to reading. 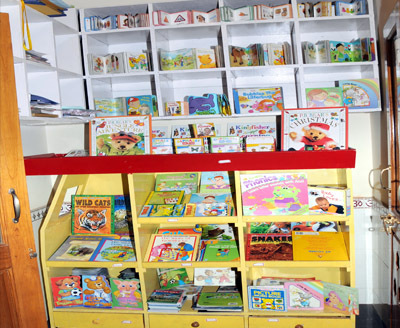 Periwinkle Library is to promote the reading habit to a child at his/her early days of schooling. Teaching alphabets to kids by associating it with their sounds is phonic reading. It helps them read the language with fluency and accuracy. Phonics is a scientific approach to ease the problem of memorizing the spellings in English language. Periwinkle’s curriculum compliments it with colorful animated worksheets, rhyming songs and stories makes it enjoyable to kids. Kids ask lots of questions, which make them, explore the world around. They are naturally inquisitive and curious. Periwinkle’s simple science activities and experiments give them a skill to seek answers and look at the world scientifically. 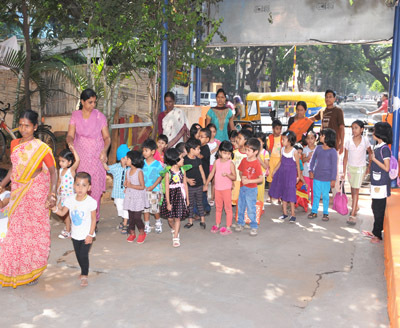 Children are taken to nearby places for an additional practical learning. 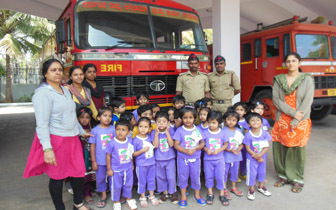 Periwinkle's field trips such as to Fire station and post office visits to know about the public service facilities or to a park or temple to know more about social gatherings or car showroom or the vegetable/fruit shops to know about the things we use in daily life. 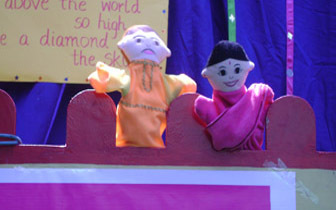 At Periwinkle, stories and plays are expressed to children through puppet shows. Looking at the miniature characters on the hands of their teachers, children jump with joy. When characters move around and converse, the child's excitement has no bounds. 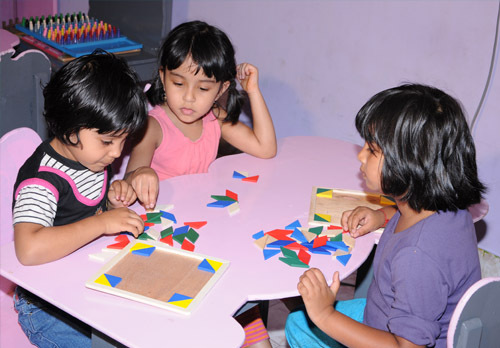 Periwinkle aims at providing pleasure of learning through these joyous methods. 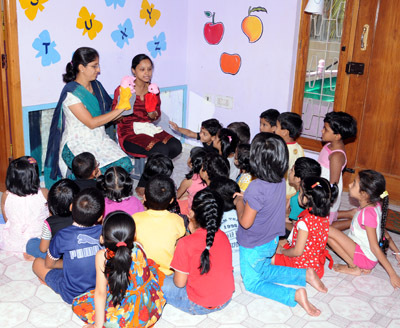 Several activities such as the teacher pouring water on children holding umbrellas to teach how to protect us from rainy season, making children hop like rabbits to find the carrot through a maze drawn by teacher on the grounds, searching the similar colour cards in sand play for treasure hunt, making a slip-on with the foot prints of kids, singing good manners through rhymes, etc. are the byproducts of constant and continuous effort of Periwinkle’s teachers and management at the weekly meetings to make a child’s learning better and happy. 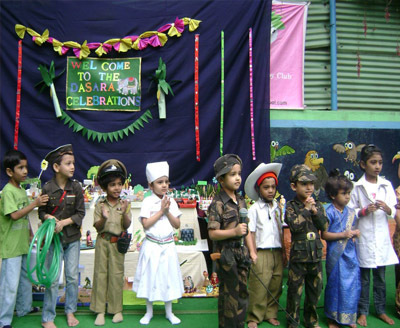 Along with the day to day activities of physical and cultural events, Periwinkle encourages all the children to showcase their talents on stage every year through annual day and sports day celebrations. We believe that every child is a winner in its own way. So, all of them are awarded during sports day and annual day without any gradations.